Key Difference: Malt whisky is a whiskey generally made from barley malt which is fermented with yeast and then distilled. Blended whisky is made by mixing different types of whiskies. They can be either prepared by mixing single malts or other whiskies like grain or both. Malt whisky is a whiskey which is made from a fermented mash made by only malted grain, especially barley. Malt refers to the barley which is soaked and allowed to germinate. After germinated, it is then dried to get rid of the moisture and sprout. Some other grains like rye and wheat can also be used for malting. According to Scotch Whisky Regulations, barley malt must be used for making single malt and blended malt Scotch whisky. However, U.S. Standards of Identity is more liberal when it comes to content. They consider the composition of this whisky as - malt whisky to be 51 percent malted barley and rye malt whisky to be 51 percent malted rye grain. Blended whisky is made from the combination of malt and grain whisky. Malt and grain whiskies are distilled separately and after a certain minimum period which is usually three years, they are combined to form blended whiskies. 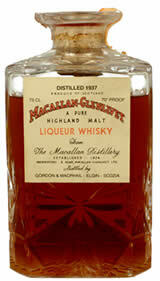 Blended scotch is made from a mixture of different single malts. In case, it is made only form malt whiskies then it is known as blended malt. Grain whisky is blended with assorted single malt whiskies to make blended ones, as it usually cost less and produces a consistent whiskey. The ratio of grain to single malts generally remains to be 60:40. However, it may differ in some places. Blended word can also be used in context to blended malt whisky which is a blend of single malt whiskies but from two or more distilleries or blended grain whisky which is produced by blending grain whiskies but from different distilleries.